When I was graduating from college in 1984 with my undergraduate degree in business and marketing, I had no clue that I would have a career in the green industry. I was simply looking for a company that would provide me with an opportunity, that would invest in me and provide me career potential. In return, I would give the company my dedication. This seemed like a fair trade, and it led me to the beginning of a green industry career of more than 32 years now (and counting). I believe there are many prospective employees who feel the same way I did. Show them a good opportunity, explain how you will support them and invest in their future. People are looking for a place to call home, and it’s up to us as employers to show them what their new home looks like. Put yourself in the shoes of a person who just graduated from college or high school and is looking to start a career. The pressure is on. Parents, grandparents and other people in his or her life are watching, hoping that the outpouring of support they’ve provided leads to something great. 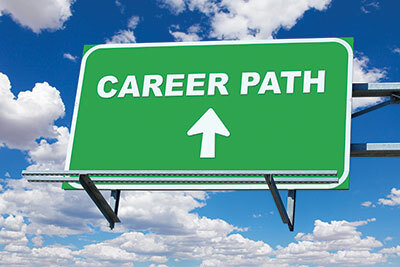 Landing the big career job is step one, although many times the “big” career job isn’t all that big. My first “big” career job was an entry-level management trainee job with a regional lawn and garden retailer. My first day consisted of loading bags of cow manure into the trunks of people’s cars, among other things. Not so glamorous. Not very big at all. However, I had been provided a clear vision of the career path I was on, and so it didn’t matter what tasks were required of me. I was all in because I knew the path entailed learning how to perform the tasks that I would be managing. I’m glad that I started at the bottom. It’s much more rewarding to look back on my career and know that nothing was handed to me. Like many of you, I paid my dues. But, what kept us on track? Why didn’t we bail along the way? There are three essential ingredients that made all the difference: career laddering (vision casting), professional development plans and feedback sessions. Let’s look at each in more detail. Before I worked one day in the green industry, a highly-skilled recruiter cast a vision of the future for me. He captured my attention—not only with a job offer—but with a vision of a career. The steps were laid out in front of me. I had a sense of timing for each step. All I had to do was make a decision to get started down a path. This is commonly called career laddering. Try it. It works. It is the first essential ingredient. The second essential ingredient is a professional development plan. Before I even accepted the job offer, I knew what type of training and development I would receive over the next few years. Professional development was not an option. It was expected—required to advance in the company. It was obvious to me that the company was prepared to invest in me and my future. I see many companies that take a different approach with professional development. They may invest in certain high-potential people but not everyone, creating an “us versus them” situation and negative feelings of favoritism. Investments are small and inconsistent. Sending everyone to a local trade show once a year, for example, has limited impact in the long term on a person’s career. Unfortunately, this type of short-sightedness is the norm in our industry. Professional development does cost money, but what’s the alternative? The final ingredient is a regular feedback session to review career progress, discuss obstacles and identify support needed. These meetings are an honest conversation between a person and his or her boss. They’re not intended to be formal performance reviews and should not involve discussions about compensation. They’re informal, organic and positive. I’ve had the opportunity to work with (and for) some of the best people I’ve ever known. The feedback I’ve received from them has guided me, corrected me and challenged me to be my best. Sometimes feedback is tough to hear. However, I’d rather hear the truth about the situation—even if it hurts—so I can respond accordingly, especially when it involves my career. Honest, transparent, regular feedback is critical. How can we grow careers? We can do so by providing well-laid-out career paths, professional development and honest feedback along the way.